I had been home for a week when I was browsing my next door neighbor's garage sale. 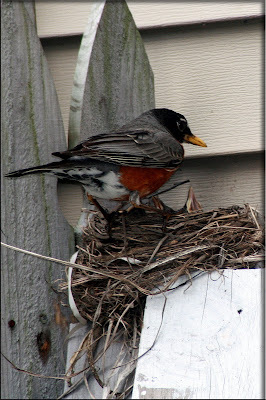 He pointed out this robin's nest right in the corner of my house and back gate...on the top of two boards just leaning there. 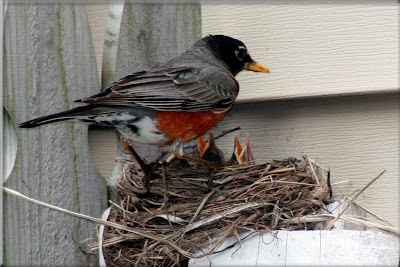 The parent did not seem to mind our being there and the babies were not particularly quiet. This house, in its original form, has fascinated me since our first drive along the water in 2003. Originally it was an ice house for all the commercial fishing establishments along this drive. When we started wintering here, it was owned by a famous singer who was restoring it. His tour bus was often parked alongside. Then the hurricanes of 2004 all but demolished the historic building and work was stopped for a while. It was said the "famous singer" was disenchanted with the town for allowing some 3-story condos to be built near him. It was also rumored that he had sold it to another even MORE famous singer. Whatever actually happened, it was torn down except one corner wall and is being rebuilt...but by whom? What will it become? We can't wait to return next January and see how it turns out. Certainly one of our neighbors will have heard who owns it now. Weeks ago the city blocked off part of the street along the shore to build a park, and parking for people launching boats at the new city ramps. We have kept an eye on the project, hoping to see it finished before we had to leave. A lot of it HAS been finished, but not enough to actually see what it will be like. I wanted to take these photos as a record so I can take more next January when we return. What is this little building? That is the Indian River behind the big pile of sand. The green truck is on what USED to be part of Indian River Drive. This part of the road has been closed off since well before Easter making our favorite evening drive all but impossible. Our main concern is whether or not the city fathers are closing the road off for good or if it will be reopened when this park is finished. Most of the businesses on the drive are restaurants so maybe through traffic isn't important, and maybe they don't LIKE those of us who just like to drive along looking at the water. Still a lot of equipment around and no signs yet of boat launch ramps. Just no idea of what we will find when we come back next year. Right in the middle of this street-parking lot is this little seating area. I assume there will be a plaque, commemorative sign, and some seating, but maybe not. We will see. This is the Chamber of Commerce building which was on Main Street. Now it is on the park. I still can't tell what will be parking for cars and boat trailers and what will be street. We were just having dinner and waiting to watch the Kentucky Derby yesterday when we heard the trumpet of a Sandhill Crane...CLOSE. In fact, it turns out it was on the lawn right next door to our friends' house. At that short distance the sound will clear your sinuses!! When I got closer I could see that another bird, a Great Blue Heron was on the same lawn. We have assumed that the amount of wild life we see on a daily basis is due to the house being on a lake with a wildlife preserve island in the middle. This was in a subdivision! One with a long waterway, but still completely populated. I just had to include this photo of three yellow-headed ducks swimming past our friends' lawn. They really do see a lot of wildlife for living in a totally settled area.